When shopping for the many different types of plants available at Green Goddess, with their many beautiful and colorful flowers; the tag on each plant usually specifies if they are annuals, perennials or biannual. If you are not familiar with these terms or just curious as to which one of these would work better in your area, here is a brief explanation of each one. These are plants that live for a year. From the time of germination their life cycle covers a year, and then they die. When planted in the summer or early spring, a seed or very young plant usually matures by autumn of that year. Annuals that prefer the cooler weather germinate in the autumn and mature during the following year in the spring. Winter annuals bloom from winter to spring while summer annuals prefer the warm summer to produce their flowers. 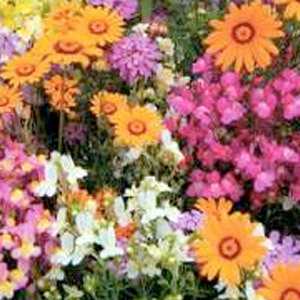 Tender Annuals – need warm soil and warm air temperatures to achieve proper growth. They do not like frost or colder weather which inhibits their growing. Half-Hardy Annuals – tolerate cooler soil and temperatures but not frost. Geranium, Dianthus, Petunia and Ageratum are examples of these half-hardy annuals. Hardy Annuals – can handle cool air, cold soil and light frost. Snap Dragon, Calendula, Pansy’s, Ornamental Cabbage and Kale fall into this category. Bacopa (Sutera Cordata) a tender annual that blooms June –October with lavender, pink, white and red flower and requires full sun. This is sometimes called a giant snowflake. Marigold (Tagetes S.P.) Yellow, orange, white flower that bloom May-October and also like full sun, a tender annual. Perennials are plants that grow for more than one season. Basically, the perennial plant lives for more than two years, during the autumn and winter they die but, their rootstock hibernates and then comes back during the spring. A common question is, “why not always get perennials since they last longer than the annuals?” Annuals often offer a larger variety of flowering plants with larger flowers and more color. But perennials also have their share of beautiful flowering plants. Blanket Flower – a wild flower that loves the heat, is drought tolerant, has daisy like flowers that are red, gold or brown and grow up to 3” wide. Lily of the Nile – blooms in the summer with funnel shaped flowers in purple, blue and white. Grows well in our area. Hibiscus – with several hundred species, this plant comes in both annual and perennial and has large trumpet shaped flowers that grow in a multitude of colors. Sage – a perennial evergreen with blue and purple flowers. Called a sub shrub this plant is also known for its medicinal use throughout the world. BIANNUAL is a plant that cycles for two (2) years and then dies. They usually bloom in their second year. Some biannual plants include the onion family, some members of the cabbage family, Black-Eyed Susan and carrots to name a few. Your Green Goddess representative is there to help you when you are selecting the appropriate plant for your garden and can answer all your questions.